1 x 24Kw Biasi Boiler (with Flue & Built In Clock). 3 x 600mm x 1000mm Type 11 Radiators. 2 x 600mm x 800mm Type 11 Radiators. 1 x 600mm x 600mm Type 11 Radiators. 6 x Thermostatic Radiator Valves. 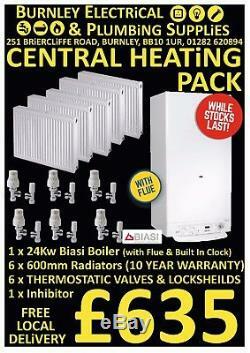 6 x Locksheild Radiator Valves 1 x Central heating cleaner 1 x FREE roll PTFE tape 1 x FREE air vent key. If our pack doesn't meet your needs please send us a list of your required items and we will get back with a quote within 24 Hours. (Pay shop direct via Debit Card). Debit card or cash in shop. 251 Briercliffe Road, Burnley, BB10 1UR. The item "Complete Central Heating Boiler Pack Biasi 24kw Boiler Radiators TRV Lockshields" is in sale since Monday, November 20, 2017. This item is in the category "Home, Furniture & DIY\Heating, Cooling & Air\Water Heaters & Boilers". The seller is "burnley_electrical" and is located in Burnley. This item can't be shipped, the buyer must pick up the item.